Cat lovers spend hours and hours petting, cuddling and stroking, right? But how well do you really know your cat? See how well you do with this short quiz... Au with his laser eyes is standing by to help. 1. How many claws does the average cat have? 18, 20, 24, 25? 2. How many whiskers does the average cat have? 20, 24, 28? 3. How many teeth does your pet cat have? 20, 24, 30? 4. Which animal has the best hearing? Cats, dogs or people? 5. Cats walk: like camels and giraffes by moving the front and back legs on one side first, and then the front and back legs on the other side; like dogs and horses by moving the left hind leg first followed by the left front leg, right hind leg, and right front leg. Answers in the first comment box by 9AM Malaysian time! 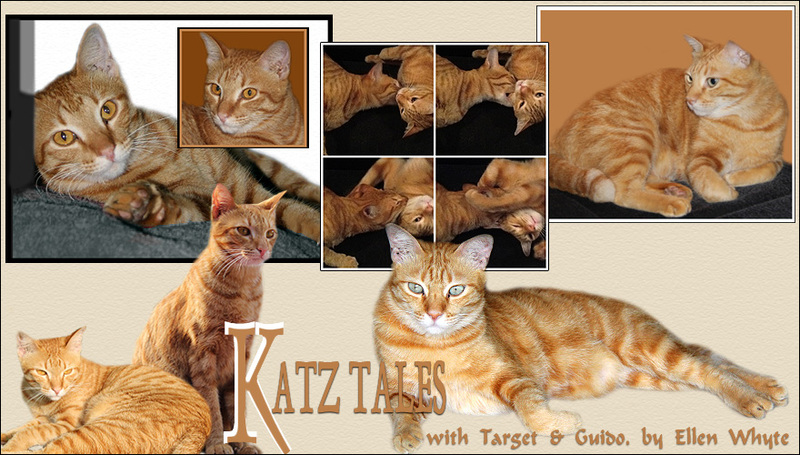 See more cats at Gattina's or click on the left menu for our cat pals in the blogosphere. 1. Most cats have 5 claws on each front paw, and 4 on each rear paw. 18 in total. However, many cats have extra toes and claws. 2. Most cat have 12 whiskers on each side; 24 in total. I think Au has 26 (he wriggles when I count) and apparently this is not unusual either. 3. Cats have 16 teeth in the upper jaw and 14 in the lower; 30 in total. 4. Cats! Cats can hear frequencies from 55 Hz up to 79 kHz or 7 octaves. Human people can hear from 31 Hz to 18 kHz, and dogs hear from 67 Hz to 44 kHz. That’s only 6 octaves. I am very glad you gave the answers, because I was stumped. Thanks for visiting my blog and I will come back again to visit you. How interesting that you live in Malaysia. We are meeting cats and people from all over the world! Thanks for posting the answers because I had no idea. Sassie doesn't have any front claws. She had to be declawed because she kept scratching my daughter and giving her cat scratch fever. i had no idea to the answers either! and definitely did not guess that cats hear the best. We knew the answer about claws because mom is always clipping ours! She knows exactly how many there are! Other that that we didn't know. I was going to say, tough questions but I'm glad you gave the answers. I am going to check it out with my Twylah. And I don't know about their sense of smell, because I know that when its time for me to come home, she is already waiting for me by the window. Like you, I have become a pet or particularly cat lover. I am glad I rescued my cat. I knew about the claws since I have to trim Angel & Isabella's but the others stumped me! 1. 20 claws (FAIL!) I thought the round pink nubs I sometimes see on their hind feet count as claws? 5. Like dogs! (Still unsure as to the answer). This is the first test I've ever failed! And I'm usually so good at anything animal-related! Sigh! Je bent een mooie ik begon al te tellen maar dat hoeft niet !!!!! Haha...that's a fun quiz! I only got one right, and you thought you knew them all! I was about to answer 24 claws LOL but that's a wild guess I just counted it with my mind. Anyway that's very informative, now I know. You know I am just amazed when I watch cats jumps and lands with their four feet all at the same time, do you also notice that? I read your comment in my previous blog and you were asking about the flood. No more, no more floods, we are dry here now, even our hair got dry ha ha. Thanks for asking. That was very interesting. Mom knew some but not all answers. Looks like a tiny moon in the eyes! Interesting quiz and what a cute proctor looking over us Au is! I didn't know any of the answers, but I can add that cats lose baby teeth just like humans but they usually wind up swallowing them. Happy COT! Thanks for giving the answers - I was stumped on most of them! Very interesting. I had no idea on most of them. Glad to have the answers. Very interesting...that why beans love cats. We are so fascinating! Great post. Wow! That is most interesting, especially the hearing frequencies. PS I'm going to link your post to mine!